Hades is a god in Greek mythology, and the eldest son of the Titans Kronos and Rhea (mythology). He is the god of the Greek underworld. In Roman mythology he is called Pluto. In his Roman form not only is he god of the underworld but also the god of riches and despair. 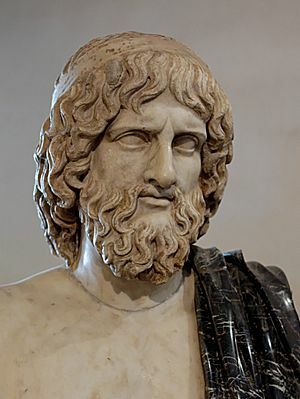 Hades is the brother of Zeus, Poseidon, Hestia, Hera and Demeter. He owns the three-headed dog Cerberus. Cerberus acts somewhat as a guardian of the Underworld. Persephone is to go there every six months since she ate the seeds of a pomegranate, this is what the ancient Greek believes causes the seasons to change. Lonely in the underworld, Hades saw and fell in love with Persephone, who was picking flowers. Persephone was the daughter of Demeter. Hades then arose from the earth and carried Persephone into the Underworld. At her absence, Demeter became anguished and searched the earth for her missing daughter, neglecting her duty of bringing flourishing plants to the mortals. The distressed mortals starved and prayed to Zeus, who had no choice but to tell Hades to give up Persephone. Hades Facts for Kids. Kiddle Encyclopedia.